John Wooden’s seven-point creed came from a 1931 magazine article. The legendary basketball coach claimed his father developed a brilliant, seven-point philosophy of life. That’s total hogwash. 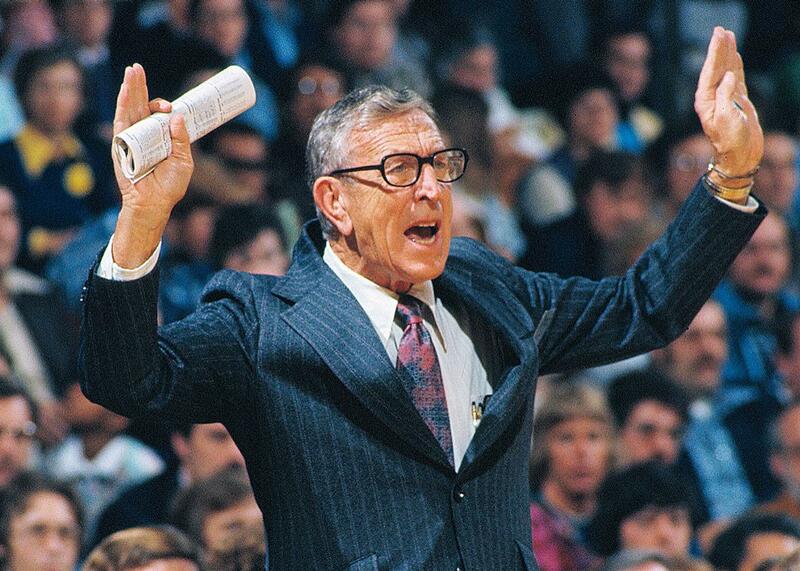 John Wooden coaches UCLA to an NCAA championship over Kentucky in San Diego on March 31, 1975. John Wooden died in 2010, but his legend remains as powerful as ever. Much of the coach’s mystique relates to his remarkable record: From 1964 through 1975, his UCLA basketball teams won 10 NCAA championships, including streaks of seven consecutive titles, 88 straight regular-season victories, and 38 straight NCAA Tournament wins. But the Wizard of Westwood’s lore extends beyond bottom-line results to off-court wisdom. The tale of Joshua passing on his personal creed has become an entrenched part of the Wooden mythos, a story related in Williams’ book and Seth Davis’ Wooden: A Coach’s Life and numerous tomes co-authored by the coach himself. There is no doubt that the story of the seven-point creed is powerful and inspiring. It is also not entirely true. Contrary to legend, Joshua Wooden did not come up with the seven-point creed himself. While doing research for my dissertation on American sports and Christianity, I discovered that Wooden’s father copied the creed from an article titled “Help Yourself to Happiness.” That story, which was published in the American Magazine in 1931, was based on an interview with John H. Clarke, who in 1922 resigned from his position as a Supreme Court justice to live a less strenuous life of travel and contemplation. Other than the seventh point (“Pray for guidance and count and give thanks for your blessings every day”) and an additional phrase after the fourth (“especially the Bible”), Justice Clarke’s list is identical to Wooden’s seven-point creed. A 1956 article in the Los Angeles Times provides clarity on the two discrepancies. The article quotes the coach as telling UCLA students that his father’s words—“ ‘An Adopted Creed,’ which I have always carried in my wallet”—would help them focus on building character rather than accumulating material possessions. In articulating the creed, he lists the six points laid out in the American Magazine article; there is no seventh point, and no mention of “especially the Bible” after the fourth point. It is clear, then, that Joshua Wooden’s creed did not come from the mind of an ordinary man from the Midwest, and that John Wooden knew his father’s wisdom had been “adopted” from elsewhere. Given that the creed was originally published in 1931 and that Wooden told the UCLA students he received it when he was in college, we can also be sure that Joshua didn’t pass it along to his son upon his eighth-grade graduation; John, who was born in 1910, was enrolled at Purdue University in 1931. What we can say with certainty is that Justice Clarke’s six rules for happiness resonated with John Wooden’s father, that he chose to make those precepts his own, and that he passed those rules on to his son. But what happened after 1956? How and why did this origin story change? Whether intentional or not, in reframing his father’s creed as a reflection of the values of small-town Midwestern life, Wooden (or his ghostwriter) offered powerful evidence for the continued importance of traditional values in an age of upheaval. The new origin story resonated deeply with long-standing American myths: Joshua Wooden, an ordinary and self-educated man with no special claim to fame, worked hard and passed his practical wisdom on to his son. His son in turn applied those principles on his path to phenomenal success. In his 2011 book on Wooden, Pat Williams asked the coach’s former players what they remembered about the seven-point creed. Most of them, it turned out, didn’t recall hearing anything about it during their playing days. But there was another audience eager to learn from Wooden’s advice. The 1972 publication of Wooden’s autobiography—which included both the seven-point creed and the Pyramid of Success—helped market the coach’s wisdom to the business community. That connection has only gotten stronger in the last few decades, with the release of books like Wooden on Leadership: How to Create a Winning Organization and Beyond Success: The 15 Secrets to Effective Leadership and Life Based on Legendary Coach John Wooden’s Pyramid of Success. Given The American Magazine’s close links with the business world of the 1920s and 1930s, the recent proliferation of books that link Wooden’s life philosophy with corporate success have brought Clarke’s six rules for happiness full circle. A message intended for businessmen in 1931 apparently appeals to businessmen and businesswomen in the 21st century. Wooden’s acolytes may see this as evidence of the timelessness of his message; after all, it is rarely considered a bad thing to “help others.” But the reality is that Wooden’s advice is firmly rooted in the values of the early 20th century United States. Rather than timelessness, then, the continued relevance of Wooden’s seven-point creed reflects the persistence of the American belief in the superiority of small-town values. It also embodies the paradoxical idea central to The American Magazine’s message: True success cannot be measured in wins and losses, but those with more wins than losses are best qualified to explain its ingredients.